I always thought so, so I got involved. Working with the organizer behind TEDxKC (Mike Lundgren), I curated speakers, built a promotional website, and assisted in event operations. Meetings for the April event began in October 2015. I began reaching out to my Thiel Fellowship and Next Gen Summit networks, in order to find high school and college speakers for the event. In the end, two of my nominations were chosen for the final roll: Gustavo Diaz and Eli Wachs. I worked with them over the next few months to develop their talks. 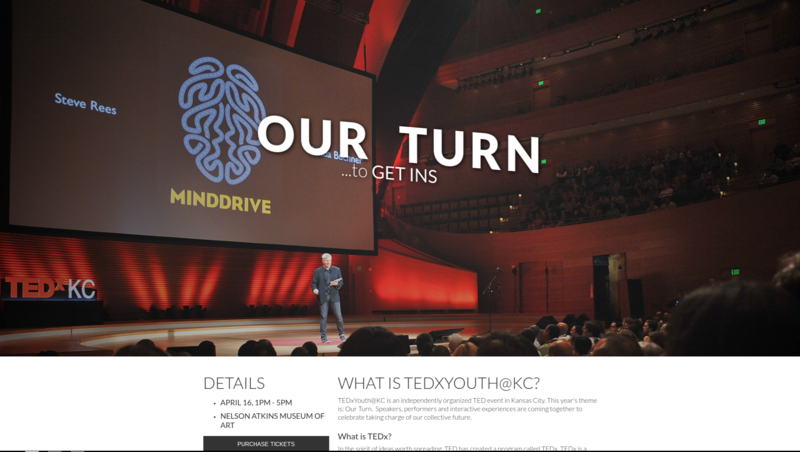 During this time, I also designed and built the event website (found at http://www.tedxyouthkc.org). I created mockups on Figma, then prototyped and hosted the site on Webflow. The day of the April 2016 event was a huge success, both in the auditorium and outside of it; of particular enjoyment were the VR station and surprise Shakespeare performance. Gustavo's talk can be found at https://www.youtube.com/watch?v=KkWEk1cwMjA, and Eli's can be seen at https://www.youtube.com/watch?v=ZZYci5Bxnl0.